Plant tissue culture is most often practiced using semi-solid medium using “gelling agents” like agar. The gelled medium restricts water and nutrient availability and can limit plant growth. Furthermore, the gelled medium can also limit oxygen availability and promote development of a rudimentary root system. Those roots are often considered non-functional and difficult to move to soil for acclimatization. At transplant, the gelled medium containing sugar needs to be washed off, which is a very laborious process. During washing and transplant, the roots get damaged and can result in slowing down the greenhouse growth or even jeopardize their survival. Alternatively, plant tissue culture in liquid medium often has better growth than in gelled semi-solid medium due to the increased availability of water and solutes. However, aerating shoots is necessary to prevent hyperhydricity and anoxia. Choosing a mechanical system for aeration involves increased cost, mechanical complexity and ergonomic problems, balanced against the anticipated improvements in growth responses. For these reasons Smithers-Oasis Company partnered with Clemson University to develop a much simpler partial immersion system, which combines the simplicity of a culture vessel and the many advantages of liquid culture system. The breakthrough technology from OASIS® Grower Solutions replaces the gelling agent with an engineered cellular foam that allows the plants to root in a liquid medium while maintaining optimal aeration. The OASIS® InVitro Express was developed to improve water, oxygen and nutrient availability to the plants, and also to promote a rapid greenhouse transplant with minimal damage or disturbance to the root system. To investigate the transplant ease and greenhouse growth of plants rooted in conventional agar culture and in OASIS® InVitro Express (IVE) where shoots were rooted in cellular foam. 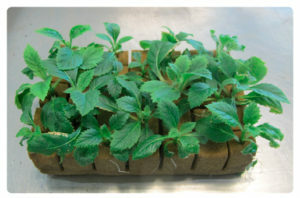 We also investigated the greenhouse growth response as affected by pre-transplant bright-light acclimatization of plantlets while remaining in sterile vented flexible film tissue culture vessels with sugar containing medium. The plant material used in this experiment was Hydrangea quercifolia ‘Sikes Dwarf’ and the experiment was conducted at Clemson University, Clemson, SC. Prior to experimental treatments, the Hydrangea quercifolia “Sikes Dwarf” has been maintained by routine subculture on modified MS (1962) gelled with agar. The experimental treatments consisted of agar-medium or liquid-infused OASIS® IVE in square rigid polycarbonate boxes (MK-5, Caisson Laboratories, Logan UT, USA) and liquid-infused OASIS® IVE enclosed in vented flexible film vessels (2, 1-cm2 microporus membranes). The experiment was a completely randomized design. Following ANOVA, the results that were significantly different (P<0.05) were presented. The agar in a box and the IVE in a box were grown for 6 weeks under fluorescent light. The IVE in flexible film vessels with 2 vents were grown for 5 weeks under fluorescent light (the first 4 weeks with vents covered with tape, then 1 week the vents were uncovered), then in mist under sunlight for 1 week in the vessel. At time of planting, the agar medium was washed from the individual rooted plantlets, and the liquid medium was removed from IVE by overhead leaching using a greenhouse hose and a breaker with tap water. The plantlets rooted in the IVE were separated by breaking apart single foam cells, keeping the roots intact in the foam cells. All plants went to the mist bed for two weeks, then the plants were moved to a greenhouse nursery for four weeks and hand watered as necessary with 100 ppm N of Jack’s professional LX (15-15-15 4Ca 2Mg, J.R Peters, Inc., Allentown, PA, USA). Following six weeks in vessels, the plants were similar in size and appearance. With the IVE, the separation of the plantlets, washing off the media, and the transplanting was extremely fast compared to the agar. Also the roots remained intact in the IVE. Plants from all of the treatments survived well when transferred to a soilless mix (92% for all treatments). Summer in South Carolina is a hot period and a good test of quality for the survival of woody plants from tissue culture. After 6 weeks of greenhouse growth, the plants from the agar were smaller in both stem length and the size of the leaves. 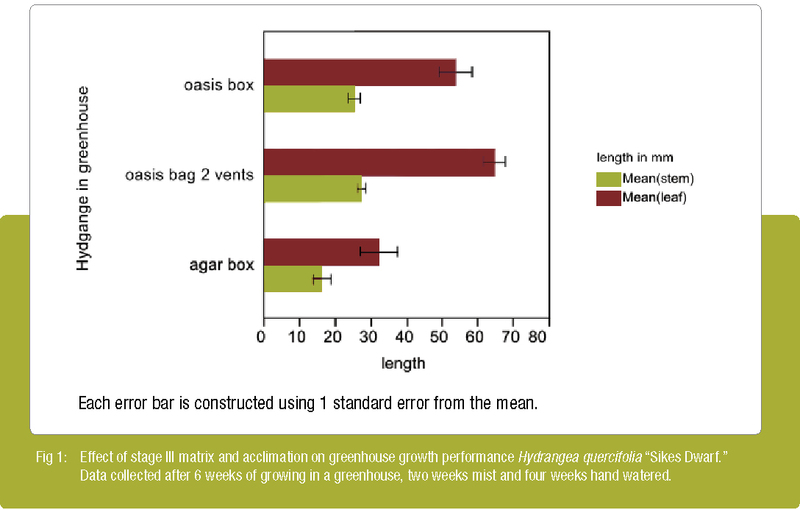 Although the agar grown plants had started out the same size, the IVE rooted plants had overtaken them by a considerable margin during the greenhouse growth. The Hydrangea plants with the largest leaves and best appearance came from treatments that were brought through the natural light, acclimatization while in the vented vessels. Washing the sugar containing medium was extremely easy and rapid with the IVE compared to the agar. Separation of the rooted plantlets and transplanting into peat based media in the greenhouse was also very seamless and fast. When the IVE replaces agar, the rooting occurs in a well aerated cellular structure with ample oxygen. The cellular structure and foam geometry facilitate water availability and aeration during the rooting process. There is little mechanical disturbance to the root while transplanting and this is what is allowing for uniform and better growth in the greenhouse. When the IVE is used in a vented flexible vessel and the plants are bright light acclimatized while in the sterile bags, the greenhouse growth is much superior compared to the ones that are not acclimatized before transplant.